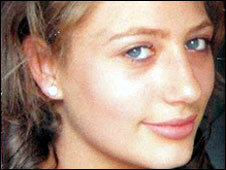 A police officer has been jailed for causing the death of a 16-year-old schoolgirl by dangerous driving. Pc John Dougal, 41, accelerated to 94mph (151km/h) in a 30mph zone before he hit Hayley Adamson in Newcastle's Denton Road on 19 May last year. He was jailed for three years on Friday after earlier being convicted at Newcastle Crown Court. Dougal was chasing a suspect car at the time, but did not have his siren or blue lights switched on. During his trial it emerged Dougal was reacting to the automatic number plate recognition system of his Volvo patrol car, which alerted him to a passing Renault Megane. But the device was incorrect and the Megane was being lawfully driven. Dougal accelerated to catch it up and struck Miss Adamson, of Cedar Road, Fenham, when she stepped into the road. It was estimated that the Volvo had slowed to about 70mph when it hit the teenager. She had been drinking alcohol, which may have affected her decision-making, but the court heard that it was difficult to judge traffic speed, especially at night. Dougal told the court during his trial he had not wanted to alert the Megane driver that he was being pursued by putting on his sirens. The officer, a qualified advanced driver, was travelling so fast he had effectively become a passenger in his own car and had surrendered "to physics", according to a police driving instructor who gave evidence during the trial. 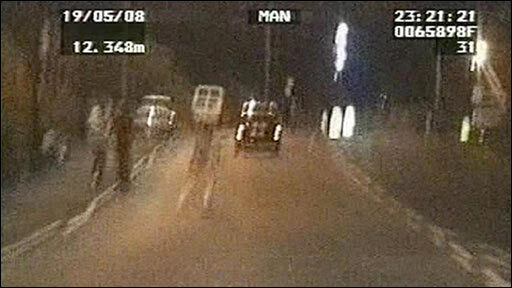 After the trial Gary Garland, the North East Commissioner for the Independent Police Complaints Commission, said the tragedy "should have been totally avoidable". He said: "Pc John Dougal is a highly trained police driver, yet he chose to take totally unnecessary and unacceptable risks and travel at high speed on a residential road. "He had no justification whatsoever to drive at such excessive speed. "Being a highly trained police driver should never be used as licence to take unnecessary risks on public roads." Judge Hodson also banned Dougal from driving for four years. He said: "To the grieving family, no sentence can ever be long enough." He also said Dougal's decision not to use warning lights or sirens was in breach of the Chief Constable's guidance. Judge Hodson added: "The tragic and inescapable fact is that when Hayley decided to cross the road, you would not have been in her vision. "It is true you had slowed down but at the point of impact your speed was estimated as being between 68 and 72mph - she was killed instantly." He said he would have jailed Dougal for four years but took into account mitigating factors. He said: "You have given conspicuous service to Northumbria Police where you have been highly regarded by senior officers and colleagues alike. "You have now resigned from the police force with all that means for you and your family. "I appreciate you are genuinely remorseful. "I have heard you say yourself that you thought of what you had done to Hayley every day. I am convinced that that is genuine." Speaking after the sentencing Miss Adamson's aunt, Heather Kinlock, said justice had been done. She said: "We now hope that Pc Dougal is aware that not only has he destroyed our family unit, but also our community. "With this verdict we feel that justice has been done. However, no sentence passed can compensate for our loss. 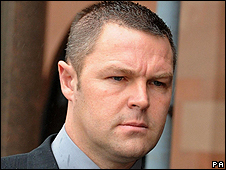 "Pc Dougal took the law into his own hands that night and left our lives shattered forever."